Cockeyed Caravan: Underrated Movie #5: The 5000 Fingers of Dr. T.
Underrated Movie #5: The 5000 Fingers of Dr. T.
The Story: Little Bart Collins, forced to practice the piano instead of playing outside, dreams up a nightmare world in which his piano instructor is an evil dictator building an army of enslaved boys. Bart recruits a salt-of-the-earth plumber to help him mount a revolution. How it Came to be Underrated: Absurdism is never in fashion, but it’s baffling that this movie didn’t find some way to break through in the ‘50s, and even crazier that it didn’t become a campus favorite in the ‘60s or ‘70s. It has been rediscovered on dvd, but it’s hard to fathom that this movie still hasn’t become a household name like the Grinch or the Lorax. Like Spike Jonze’s Where the Wild Things Are, this is a movie about children as much as it’s a movie for children. Children can just enjoy it, but adult viewers will see how Bart's fantasy world reflects the dreams and fears of Bart’s waking life. It’s one of the most bizarre and artificial-looking movies ever created, but one that nevertheless has the ring of truth, since the emotions are real, the actors believe in what they’re doing, and everything has a certain deranged logic to it. I always defend horror movies by saying “Drama is how it is, horror is how it feels.” This is a movie about how life felt to a child of the '50s. Not just dread of piano lessons, but deeper fears of parental abandonment and atomic war seep out of poor Bart’s subconscious onto the screen. 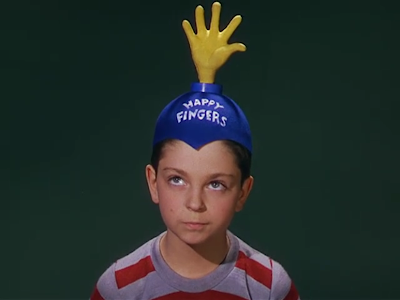 The ’50s may have been repressed, but they weren’t repressed very well. 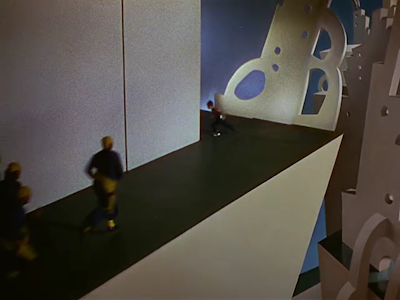 Pity the poor construction department who somehow managed to build a live-action approximation of Seuss’s drawings, one that actors could actually interact with and believe in! My favorite items, inevitably, are the beanies that the piano-playing army are forced to wear. Surely some of these beanies must have survived the shoot, right? 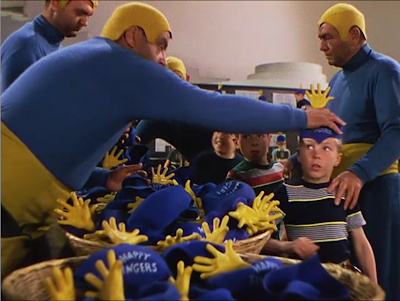 If I ever spent a fortune on a collectible, it would be to own one of those original beanies. The final mystery: This is a satirical tale of a boy named Bart with an adult nemesis named Terwilliker, and yet Matt Groening has claimed that Bart Simpson’s name is merely an anagram of “brat” and that Bart’s nemesis Sideshow Bob Terwilliger was named after a street in Portland, Oregon, as were many other Simpsons characters. Dan Castanella, however, has claimed that Sideshow Bob, at least, did get his name from this movie. The world may never know. Underrated Compared To: Those dreadful live-action ‘50s Disney movies. If You Like This, You Should Also Check Out: There’s nothing else remotely like this. Mary Poppins, maybe? That’s always worth watching again. How Available Is It? : It’s on dvd, but not on Netflix watch instantly. Resist the temptation to just watch the musical sequences on YouTube. 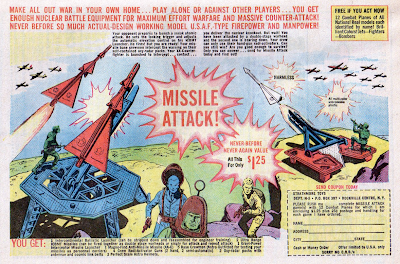 Today’s Post Was Brought To You By: Missile Attack! Came here from Betsy's, BTW. Great blog! Thanks, Cheryl, you've got a fine blog yourself. Have always loved this movie which is, ahem, the same age I am. Apparently this film originally ran over 2 hours. Noone is quite sure what wound up on the cutting room floor, but the bootleg soundtrack had acetates of some of the deleted songs. I'm so glad you highlighted the dressing up song. 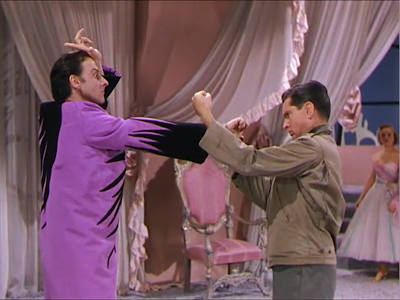 It's such an amazingly genius thing to have the villain, on the verge of unveiling his plan and conquering the heroes, sing a nonsense song about his clothes. Reading your critique of this little gem was pure pleasure for me. So many highlights, usually the songs, and especially 'Come on and Dress Me'. But as you write here, don't seek out the clips, watch the entire film. Two things will happen; time will fly, and it will stay with oyu a long time.